Apple’s Preview application works perfectly fine for viewing PDFs, but many people still prefer to use Adobe’s free Reader 7 application—some people work in all-Adobe shops, while others just prefer Adobe’s interface and feature set to that of Preview. But the application also takes much longer to load than Preview and uses a relatively large amount of RAM—over 30MB of real RAM in its stock configuration on my machine, and that’s without even opening a PDF. Here are two ways to greatly improve Reader’s startup time and reduce how much RAM it consumes. The Brute Force Method When you launch Reader, simply hold down the Shift key. Doing so will disable all plug-ins for the current session. You’ll find that Reader loads very quickly, but also has quite-limited functionality—you won’t be able to click hyperlinks or search a PDF, for instance. Reader will return to normal the next time you launch it without the Shift key held down. Leave these four enabled so you can click on links, see slideshows, and search within PDFs. That’s all you need to do. Close the Info window, and then launch Reader. When I look at the real memory usage using OS X’s Activity Monitor (/Applications/Utilities), Reader now takes only 15MB, instead of its previous 30MB. And Reader launches quite quickly now, too. Unless you’re viewing some really advanced PDFs, you shouldn’t find any decrease in functionality. 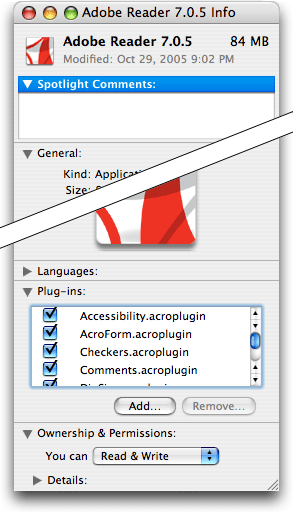 If you work with forms or comments, for instance, you’ll need to reactivate AcroForm, Comments, and EFS. Note that the filename is the name shown on the right side of the window, not the item name in the left side column’s list.